Tires help get power to the ground, and without the right set, it’s possible to sit in an infinite burnout without going anywhere. What many don’t understand is that the proper suspension setup is much more important than the right set of shoes. if the tires can’t make eﬀective contact with the road, then they won’t get you anywhere. Getting the power down to the ground is one important characteristic, ride comfort, clearance, style and safety are others. 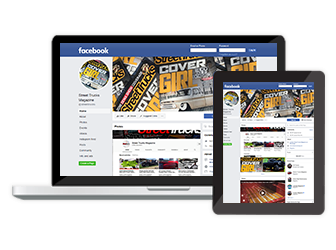 when picking your suspension setup, all ﬁve aspects need to be taken into consideration. added beneﬁt of airbags is an ultra-smooth ride, however, most of these systems are not optimized for handling or high-powered drivetrains. 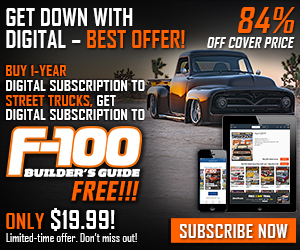 everything perfectly—it’s a give-and-take situation—but that doesn’t mean you can’t have a rig that rides and performs great both on and off the highway. 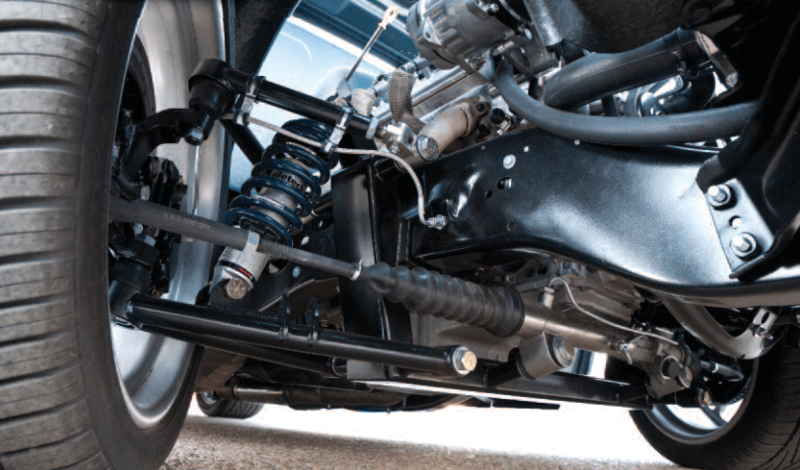 Multiple suspension designs exist, and they all offer certain qualities that make them better for one situation versus another. To properly set up your rig, you’ll first need to know what’s available, how each system works, what they do well, and what they don’t do well. 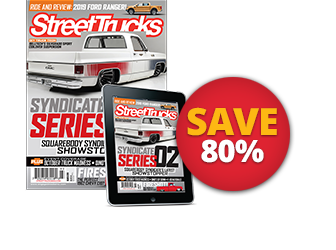 From there you can decide which suspension setup is best for you and how to modify it to better suit your exact needs. Double wishbone systems, also known as a-arm suspension, are the best of all designs on the street, but are slightly lacking in the dirt. 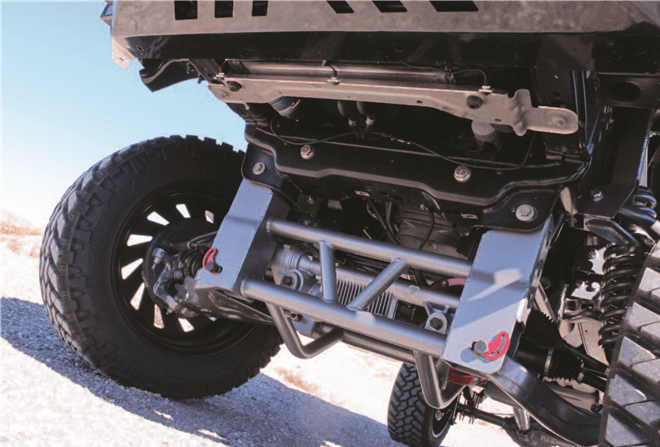 Drop-down brackets are commonly used to gain some ground clearance with double wishbone systems. the one pictured above is an extreme drop-down bracket example; most are only a few inches tall. The double wishbone suspension design was and is a total departure from straight axle and is actually a bit closer to a link setup in theory. 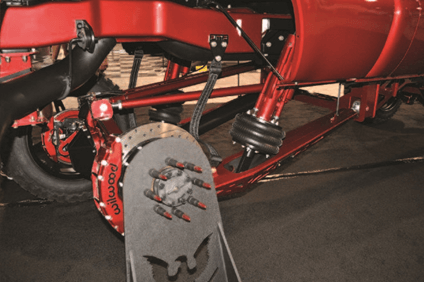 while the twin beam style was designed to reduce the bump steer of the solid axle design, double wishbone suspension takes it a step further by completely isolating the wheel and tire while keeping its travel perfectly (when designed correctly) aligned to the road, maximizing driver comfort and control. 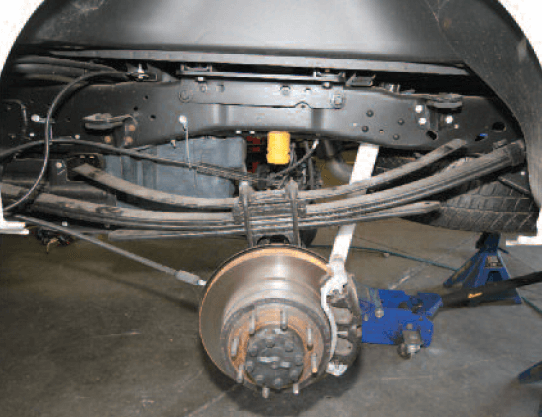 Utilizing a dual set of wishbones (often called “a-arms” or “control arms”) and a steering knuckle (spindle) in which the wheel is secured, this suspension type keeps the wheel aligned almost perfectly throughout its range of travel. It allows for extremely good on-road manners, but not as much off road in stock trim. The dual a-arms are generally parallel, so when the wheel moves over bumps, the angle of the wheel and tire stays the same and steers straight whether at full droop or full compression. spring types are all over the board here. Torsion springs are the late-model favorite, although coil springs and struts are also in the mix from the oems. For high-performance long-travel suspension setups, new, longer control arms and custom spindles are the norm. Stock springs are ditched and replaced with coil-overs in most cases. Twelve inches of travel and 6 inches of lift is a common ratio here. Just know that these types of kits are closer to “race-only” designs–on-road performance will be hindered. An oﬀ-road-racing twin I-beam design cycles a massive 26 inches of travel. Ford created the beam suspension design, and it was revolutionary when it was released. Modifying involves dropdown brackets and springs for light to medium oﬀ-road use. 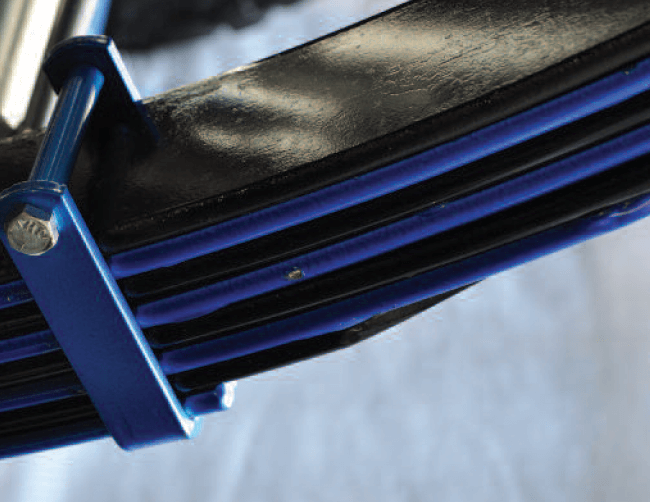 All-out race systems use new, longer I-beams and radius arms as well as coil-over shocks. Ford’s twin beam (I-beam for 2wD, twin traction beam for 4wD) suspension is a true HD truck suspension and was available in rangers, Broncos, e-Vans and F series trucks. 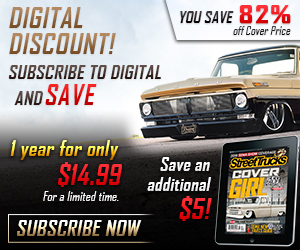 It was originally designed to reduce bump steer in vehicles that had previously used a solid axle, 2wD or 4wD. 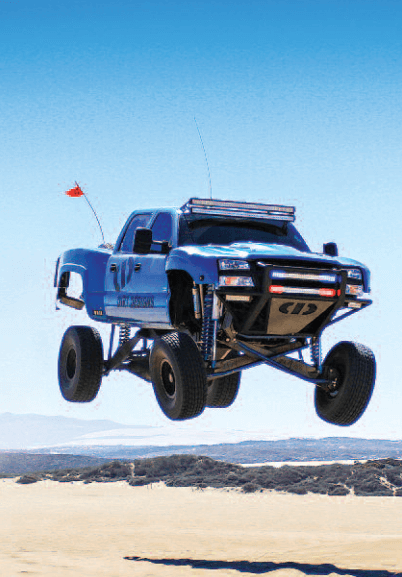 It’s a sort of happy medium between a full solid axle, which handles heavy loads extremely well and works well in the dirt, and a-arm suspension, which handles great on the road, but not as well with heavy loads or in oﬀ-road situations. Currently, no late-model vehicles sold after 2014 use this suspension design; the 2wD e-Vans were the last ones in production. 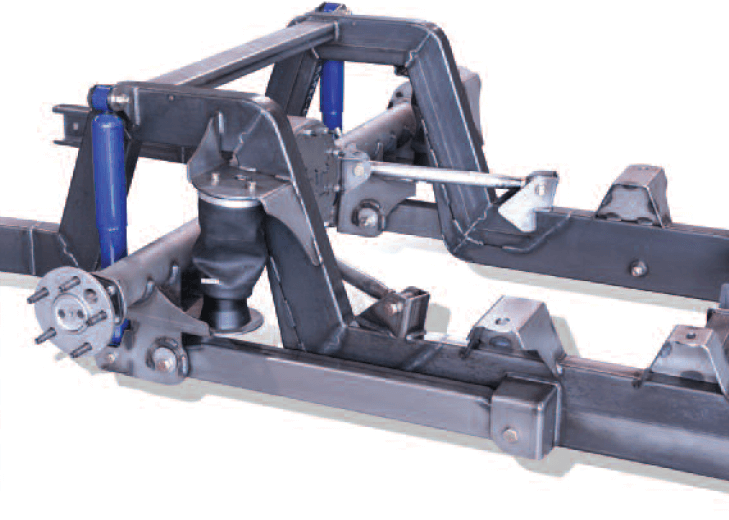 The twin beam can be best thought of as a single “L” frame: the bend in the “L” is where the wheel mounts, and the other two sides are pivot points that are mounted with bushings to diﬀerent parts of the frame. One pivot is secured under the motor mount on either side, and the others are mounted under the passenger and driver doors, respectively. By making either of the two sides longer, the amount of usable wheel travel can be increased upwards of 30 inches of travel. and unstable camber throughout the suspension’s range of travel. 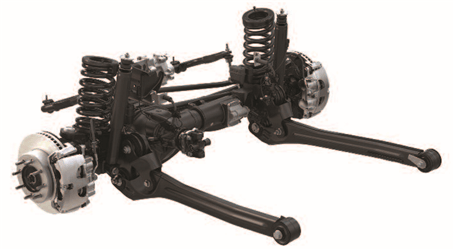 Solid axle, leaf-sprung suspension is the cheapest and easiest way to get decent results. Henry Ford used solid axles for his model t as far back as the early ’20s. They were done diﬀerently than they are today. The leaf spring was mounted transversely; in other words, it was a single sideways-mounted leaf spring. Obviously, it’s no longer a new design since it’s been around for almost a century and has undergone multiple rounds of upgrades and tweaks since its inception. Nevertheless, they work great oﬀ road, and even with the fair amount of bump steer they have, they do pretty well on road, too. Plus, they can handle substantially more weight with fewer problems than other designs. This is why we see solid axles under most suVs and every size truck. However, suspension systems for solid axles are many, and they all have their own strengths and weaknesses. there are individual ways to modify them, as well. For the factory leaf-sprung rearend on a ’14 Ford super Duty, the main two leafs locate the axle and handle basic operation spring duties. the upper and lower springs are overloads and only come into play when the vehicle is carrying a heavy load. generally have a main pack that allows for a pleasant ride during normal, unloaded daily driving. Below that spring (and sometimes above it) is an overload spring that takes over when the vehicle is loaded. It’s a much more robust spring designed to come into play only when the rig has a large load on or in it. 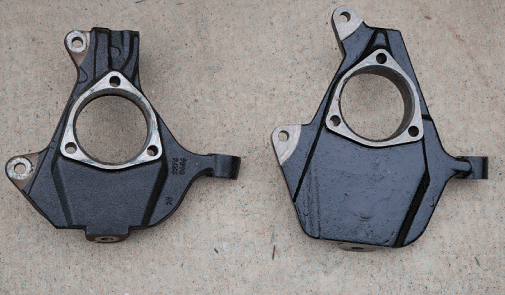 Altering height with a leafsprung suspension is simple: In the rear, blocks can be used that simply put a spacer in the suspension, raising or lowering the vehicle by whatever thickness the spacer is; although, these blocks will create added axle wrap under acceleration, wearing out driveshaft components or worse. the use of blocks should be kept to just a few inches in lift, anything higher and you should consider getting new leafs made, adding a leaf to your existing pack, or having your existing leafs rearched by a qualiﬁed shop. Drawbacks to leaf-sprung solid axles are mainly a lack of tuneability when compared to 4-link setups (see “multi-Link suspension” below). Axle wrap is also a concern but can be rectified with a set of traction bars fairly easily. Here, a race pack with multiple smaller leafs designed to carry the weight of the vehicle move freely, allowing for a better ride through rough terrain. the pictured pack has also been powder coated to match the vehicle. vehicle with some sort of pivoting joint. the axle can then move freely with little restriction within the limits that the links set. 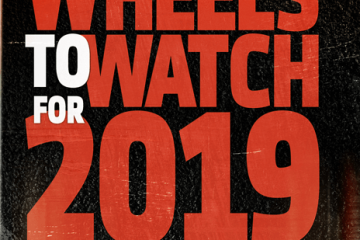 the solid links will also keep the axle aligned exactly how you want it to be, at any point in the suspension’s travel, no matter the engine load. 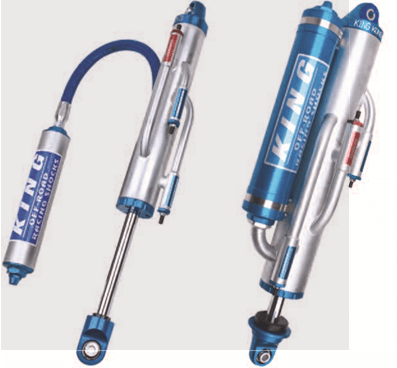 springs (air, coils, coil-overs, hydraulic arms, etc.) of any type are used to keep the vehicle at ride height. anything. adjusting things like the angle and/or the length of each link will affect how the vehicle reacts to acceleration, braking, turning, size of terrain, high-speed performance, low-speed performance, etc. Ram trucks use this radius arm suspension design. It’s very similar to 4-link designs except caster will change as the suspension cycles. This show-ready 4-link setup has triangulated upper links that help locate the axle, stopping it from wandering from side to side. It also uses trailing arms (lower) to which the bypass shcks mount. Usually, you’d see a coil-over here, but the owner has elected to use air springs instead. With multi-link suspensions, you’ll need some sort of lateral stabilization. 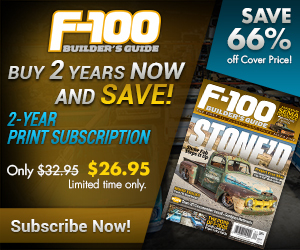 Without reinforcement, the suspension could slide right out from under your truck. a good way to combat this is with link bars that are mounted at an angle known as a “triangulated system.” If the bars are straight back and forth, you can use a simple pan hard bar. 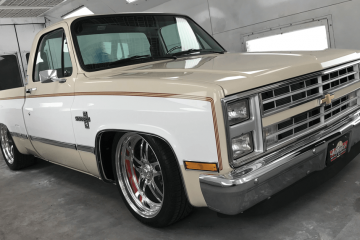 Spindles are one of the better ways of altering your truck’s height because they don’t mess with ride quality. Factory systems are set by highly skilled engineers to have the most comfortable ride while keeping good traction. 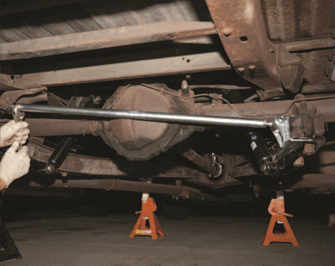 Lowered or lifted spindles change the location of the wheel-mounting point and alter the height. though they are more expensive, they will give the best ride. the only drawback is that you are limited by how much they will change the height. If you want to go lower or higher than the spindles allow, you must combine them with other parts like springs and shocks. For the ultimate in side-to-side control, a watts link will do the trick. Unlike pan hard bars, watts links won’t pull the rearend from side to side when the suspension travels up and down. control and handling. these are also adjustable in length and will allow you to get the exact height you want. there are also plenty of them that allow you to adjust the shock valving for the best ﬁrmness. Installing a set of coil-overs is always the simplest choice since most are universal and must be adapted for use. If you can make them ﬁt or have it done for you, they are a great option. If you want the ultimate in adjustability and smooth ride, airbags will get you there. the best way to use airbags is to combine them with a decent set of shocks to prevent a balloon-like ride. Airbags also need to be adapted and can be very reliable if set up correctly. These are not the best option for performance vehicles because they’re too soft and can lead to traction loss. there are some that integrate shocks for better control, but they are a compromise. A mono-tube uses a single valve on a larger moving piston and has a second independent piston that separates the ﬂuid from high-pressure nitrogen gas. thus, the gas and ﬂuid never mix, making for improved handling and continuous eﬀectiveness. 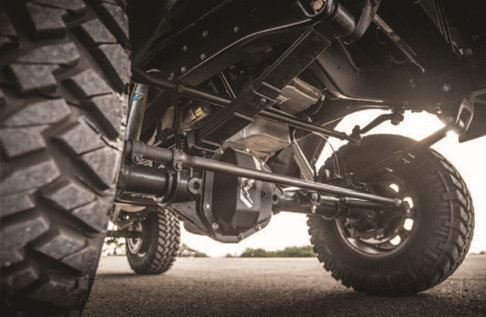 The previously mentioned shocks might work great on street applications, but when the majority of your driving is over rougher areas or oﬀ-road, they may not be the best choice. the problem occurs when the shock piston is overworked, causing the ﬂuid to heat up, sacriﬁcing performance. 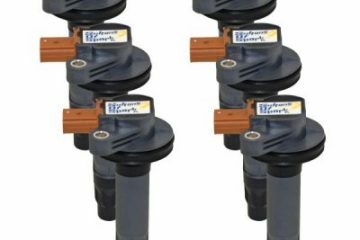 reservoir shocks can help because they have an external chamber that increases ﬂuid capacity, keeping temperatures down. there are two types: one is a piggyback reservoir shock with attached chamber, and the other is a remote reservoir shock with a loose chamber, which aﬀords more mounting position options. steel that bolt both sides of the suspension to the frame. 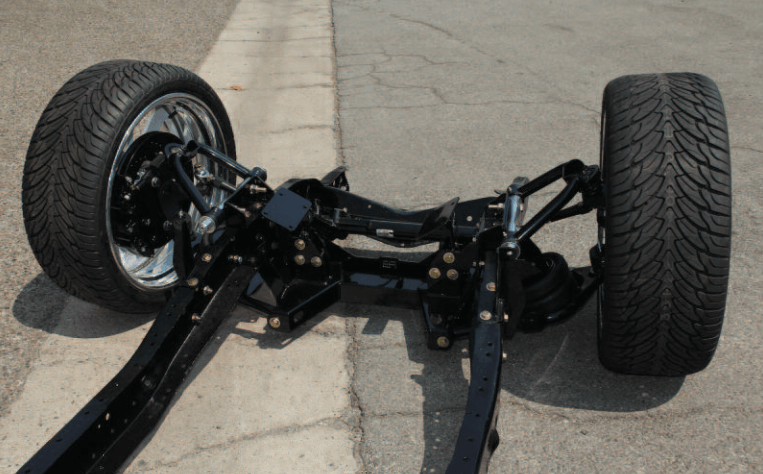 these use stiﬀness to deﬂect torsion between the two sides of the suspension system. 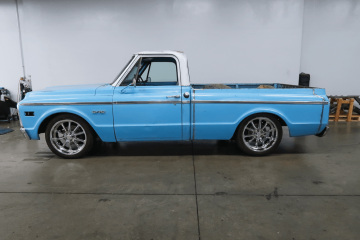 though these are great for on-road vehicles, some oﬀ-roaders choose not to use them for the sake of having more independent travel at each corner their truck.